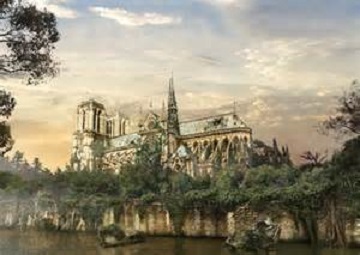 Notre Dame - The Notre Dame Cathedral in Paris is one of the first and finest examples of Gothic architecture in Europe. Gothic architecture replaced Romanesque and utilized flying buttresses as a means of supporting the weight of the roof, allowing for larger windows to replace heavy walls and let more sunlight inside the building. Notre Dame Cathedral was begun in 1163 and wasn't finished until 1345, although the bulk had been completed by 1250. While one of the most famous churches in the world, it is only one of many Gothic cathedrals built in France. France was one of the wealthiest nations in Europe at this time and the Catholic Church was very powerful. So the country went on a construction spree in the High Middle Ages. Perhaps the only other one that can compare to Notre Dame is the cathedral built in Chartres, located about 50 miles (80 km) southwest of Paris. It was begun about 30 years after Notre Dame, but completed about 30 years earlier (than the main portion of the building).